I have played plenty of Kala ukuleles over the years and actually own a few of them. This is because they are one of the best values on the market as they use good materials and their overseas workmanship is top-notch. 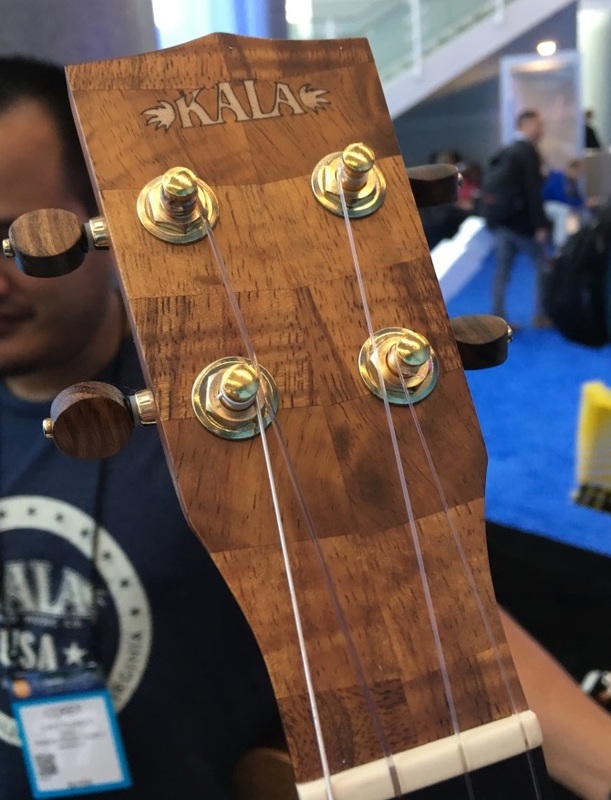 But, I have never seen them as a premium brand until their Luthier Collection caught my eye at the 2017 Winter NAMM show. - Poi Pounder. 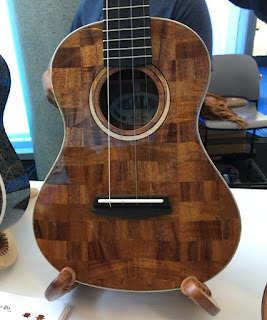 This is pretty a pretty cool name, as this tenor-sized uke is made out of Hawaiian Koa, which is the same material that is used to mash taro into the dubiously yummy poi paste. This is the most highly figured Koa I have ever seen, and it is simply breathtaking. The neck is Honduran Mahogany and the bridge and fretboard are Indian Rosewood. The binding and inlay are African Padauk, and the rosette has a trick Koa and Padauk swirl. Top quality components, including a GraphTech Nubone nut and Wittner planetary friction tuners, are standard. The list price on this model is $1599. - Parquetry Tenor. This tenor-size ukulele would make any Celtics fan happy, as its design will remind them of the parquet floor at Boston Garden. You see, in an effort to not waste beautiful wood, the luthiers fit together discarded pieces of Hawaiian Koa into a lovely mosaic, and the effect is truly wicked when it is contrasted with the Maple binding and glossy finish. The neck is Honduran Mahogany while the bridge and fretboard are Ebony. Top quality components, including a GraphTech Nubone nut and Kala open gear tuners, are standard. The list price on this model is $1599. - Three Cord Strand Koa and Three Cord Strand Maple. These two tenor ukuleles have similar specs, with one being constructed of Hawaiian Koa and the other of figured maple. They get their name as they are pieced the back is pieced together from a marquetry of Maple, Purpleheart and Koa, in deference to the Cord of Three Strands concept that you will find in Ecclesiastes 4:12 (“Though one may be overpowered, two can defend themselves. A cord of three strands is not quickly broken.” NIV). Anyway, it symbolizes strength, and religion, and really pretty wood. The neck is Honduran Mahogany and the bridge and fretboard are Indian Rosewood. Top quality components, including a GraphTech Nubone nut and closed-gear gold-plated Kala tuners, are standard. The list price on either of these models is $2299. As I said earlier, each of these is the ne plus ultra of ukuleles, and anyone who picks one of these up will surely be satisfied with their purchase. Of course these instruments are not available through just any dealer, and they may actually have to build one for you. So, head over to the Kala website at www.kalabrand.com to get the complete story.